First of all, Happy New Year everyone! Let it be more successful and more rewarding in every aspect for each and every one of you in personal and professional terms. After reading Joel Oleson's SharePoint and Office 365 2015 Predictions I can't agree more with the power of Office 365 and its growing ascendancy over on-prem versions of SharePoint, Exchange and Lync. We can definitely see that Microsoft is pushing that really hard, especially to IT Pros with the certification track changes. Just a few months ago, you had to learn Windows Server 2012 and sit three exams related with it in order to proceed to the MCSE levels for SharePoint and Exchange. Today, you have to know Office 365, no matter if you are an Exchange or SharePoint expert. Both terms are already becoming too narrow and expanded skillset will be required in order for us to be more competitive on the market and provide even higher added value to the organizations we work with. I sat the 70-347: Enabling Office 365 Services just before Christmas and I can say it was a close one with a passing score of just 775. The reason is SharePoint being just some 25 % of the exam and all the rest belonging to other Office 365 features like Exchange and Lync Online. 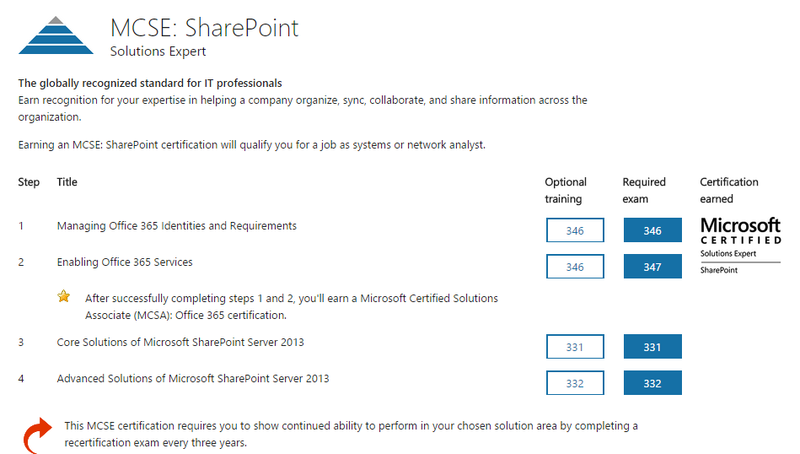 Configuring Exchange Online and Lync Online is definitely not one of my specialties, SharePoint is though and next (and final) on the list to MCSE is the 70-332: Advanced Solutions for Microsoft SharePoint Server 2013 exam which I'll sit this month. Microsoft seem to have a plan to unite all the IT Pros working with their stack by hosting the Ignite Conferene, replacing all others like the world-famous SharePoint Conference. 2015 will be intesting with vNext coming out as well, I am sure that it will be a vigorous thing.